Enjoy tacos but want to expand your horizons? The street food of Venezuela might be just the thing. 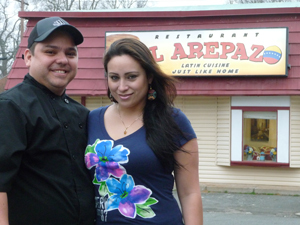 Newly opened El Arepazo, tucked behind a McDonald’s just off Albemarle Road on Charlotte’s east side, offers favorites found at food carts and take-away eateries in Venezuela. * Pinchos — skewers of seasoned beef, pork, chicken or shrimp. * Empanadas — fried turn-overs filled with meat or black beans and cheese. Be sure to try the chicken, shredded in a way that visually mimics Carolina pulled pork. * Arepas — thick tortillas sliced to accommodate a variety of fillings, including chicken-avocado salad. * Hot dogs and hamburgers — Not U.S. style but rather in the South American “everything but the kitchen sink” mode with mayo, cheese, crumbled sausage, even shoestring french fries. I especially loved discovering cachapas. Sweet pancakes made from whole kernels of corn are cooked on the griddle, then stuffed with grilled pork or chicken plus soft white queso guayana cheese. Oh, and there’s even a section labeled “International Food” — featuring Mexican tacos! “Poquito en todos: a little bit of everything,” laughs Mileydy Peñarunbda behind the counter.